Mark Echeverria raised his Old Fashioned cocktail and clinked it against the glass of my Manhattan. I was sitting across from the latest proprietor of the Musso & Frank Grill, a Hollywood landmark. Since its launch in 1919 the restaurant has attracted celluloid stars, writers and others. Charlie Chaplin used to have a favorite booth here. Raymond Chandler and F. Scott Fitzgerald were known to enjoy a few too many drinks. And the Rolling Stones come for the liver and onions. But the restaurant isn’t a tourist trap. There are no photos on the walls of the owners glad-handling the famous people that walk in. That’s because Mark, 35, wants to make the place welcoming to everyone and provide a comfortable dining environment — not a place to prioritize star-spotting. For a while in the early 1900s, Musso’s was the only restaurant in the neighborhood, so it was only natural that people working at the Hollywood studios would make it their regular destination. As the years rolled by, famous people grew to like the fact that they could go to a nice restaurant without fear of being hassled. “Our motto has always been we treat locals like celebrities and celebrities like locals,” Mark said. Other venues, like the Brown Derby, would however crow about their star-studded clientele. “And they’re not here anymore, but we are,” Mark added. If an A-lister wants to be seen and snapped for the pages of US Weekly, they go to the Ivy. 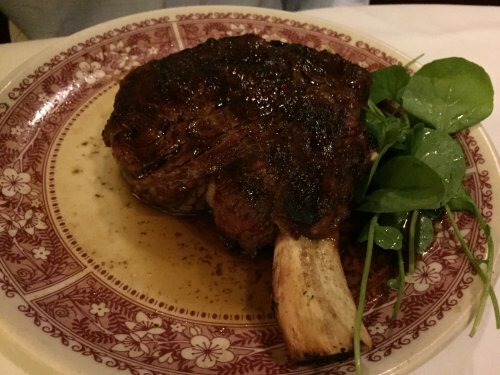 If they want to enjoy a low-key meal with their family, they go to Musso’s. He said about five to 10 percent of its business is from tourists, the rest coming from regular Angelinos — celebrities and regular folk. 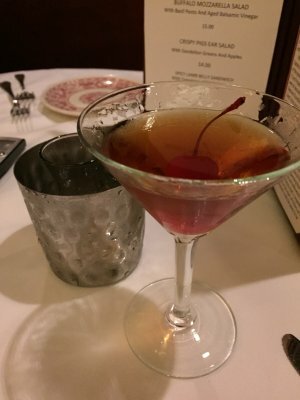 My meal at Musso’s kicked off with the perfectly made Manhattan, and while I sipped that and picked at a basket of fresh bread, I scanned the packed dining room full of smiling faces. Mark said that the scene that night is vastly different from earlier this century. Business dropped off significantly in the 80s and 90s when Warner Brothers and other movie studios relocated to Burbank to take advantage of cheaper property. “Once they moved out there was really no identity for Hollywood,” said Mark. Crime, such as prostitution, became a problem in the neighborhood. The streets got rougher. Littering got worse. The town that’s home to the sidewalk stars of fame wasn’t looking glamorous. Cut to five years ago, and Musso’s was in the center of a town on the decline. And the company wasn’t doing so well. Costs were sky-high. Management problems were rife. This is the situation that Mark inherited when he took on the role of proprietor in 2009. His family has had a stake in the restaurant since 1927, and they bought the business outright five years ago. They were determined to turn the place around and revive its fortunes, and Mark was chosen to lead the task. He didn’t have much prior experience in the sector. An avid outdoors man since his childhood growing up on a cattle ranch in Northern California, Mark was pursuing careers working in management positions at recreational resorts. He’d split his time between fishing in Alaska in summer and working at ski resorts in Colorado in winter. And then one day, his father called him and invited him to dinner — a meal that changed everything. Why such a quick acceptance from someone who was a novice in the industry? Mark studied international business at Regis University in Denver, Colorado, with an emphasis in marketing and a minor in law. He also had experience as assistant director of operations at a ski resort, overseeing issues like the costs of food and beverages. “But operating a restaurant? Totally foreign to me,” he said. So he looked to the long-serving staff for help. “I had to be humble and learn from the guys who have been doing it a long time,” Mark said. One of his mentors was a server called Sergio Gonzalez, who has been working at Musso’s since Mark’s great-grandfather hired him decades ago. He’d study the operations of the restaurant from Sergio and others, and also dove in to experience every single job in the venue. He spent a week washing dishes when the dishwasher was sick and he didn’t have the money to hire anyone. “Same thing when we were short on servers. I did it, because the job had to get done,” he said. He started by targeting problems one by one. A major issue was the cost of food. “So I started to look at our vendors. Could we get better ingredients at a better price? We were getting taken advantage of, some vendors were charging 30 percent more than for other companies. But the management until then hadn’t been paying attention, so they got away with it,” Mark said. After driving down food costs, he then turned his attention to insurance for general liability and worker compensation. And so on, finding costs and then looking at ways to cut them without hurting the quality of the food at the restaurant or turning off his employees. During dinner, Mark was at pains to tell me how much he appreciates the staff — in fact, when I first reached out to interview him, he demurred for fear it’d take the attention away from them. But then he realized that telling Musso’s story is also telling the staff’s story. And that feeling seems to be reciprocated, as I noted the amiable yet respectful way that our waiter joked and chatted with Mark as our starters arrived. 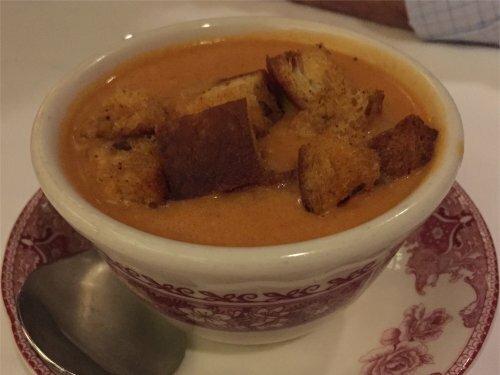 “The staff is the main focal point of the story of this restaurant,” Mark said as he sank a spoon into what looked like a delicious bowl of cream of tomato soup. “My great-grandfather always wanted to do well for the staff and that carried on through the generations. And over the years as the restaurant got older and more iconic, they took even more pride working here,” he added, noting that regulars will ask to be seated with their favorite servers who’ve been there for years. 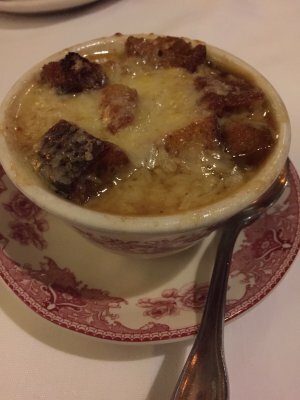 As Mark ate, I started on my order of French onion soup. It was great: a hearty broth with a slight sweetness from the onions, and packed with hefty, crisp croutons that were still crunchy and packed with flavor — unlike some varieties of this soup where the bread can be like cotton balls swimming in grease. The soup was topped off with just the right amount of cheese, which clung to each spoonful like tasty vines. He said that old-fashioned worldview has changed over the decades and female servers are now plentiful. 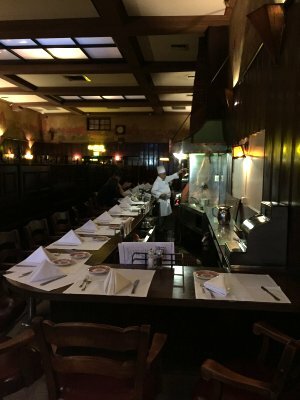 But the male-only staff is a concept that has endured at Musso’s. Mark wouldn’t ever say no to a female job candidate, but he added that the staffing turnover is so low for the long-serving waiters that there simply aren’t the openings to dole out. After finishing our starters and sipping on another round of cocktails, I told Mark that I was struggling to decide on what to order for a main course. With a broad smile he suggested taking me on a tour of the place. “Maybe the smell of the grill will inspire you,” he said. 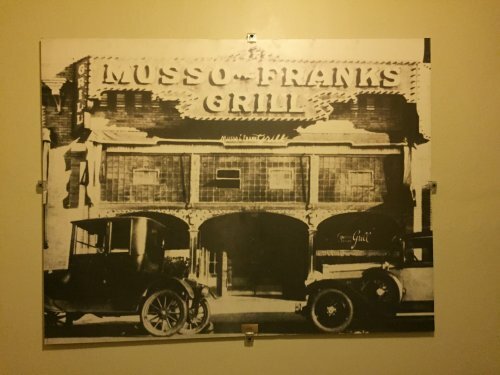 Musso’s started as Frank’s Francois Cafe in 1919 in the building next door to its current location. It was opened by a Frenchman named Frank Toulet, who offered cuisine from his home country. Then in the early 1920s a man named Joseph Musso bought in to the place, hence the current name. It was in 1927 when Mark’s great-grandfather John Mosso moved to Hollywood and bought it, teaming up with fellow Italian immigrant Joseph Carissimi as co-owners who kept the old name. 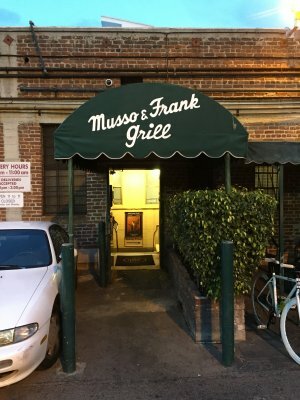 Mark says his family jokes that Mosso bought the place because Musso was so similar to his last name, but the truth is that Mosso knew Joseph and offered him the sale. In 1934, the restaurant relocated one door down in order to expand in size. 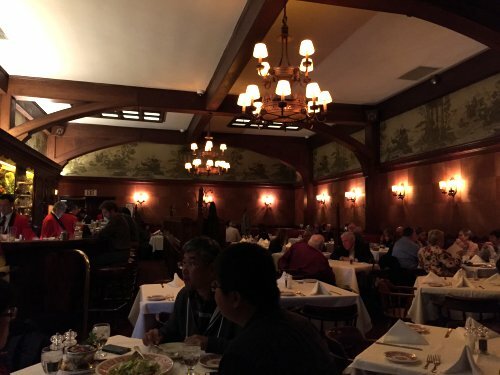 Our booth for dinner was in what’s known as the New Room, because it’s, well, the newest extension — even though “new” in Musso’s world means it was built in 1955. The fine wood paneling, brown walls, and chandeliers are all meant to emulate the former Writer’s Room, which no longer exists. It was a small part of the venue where Fitzgerald and other novelists would drink. They’d been hired by studios to write screenplays, but their style of writing was not what the studios wanted. So editors would overhaul their scripts, and the writers would need a drink to drown their sorrows. 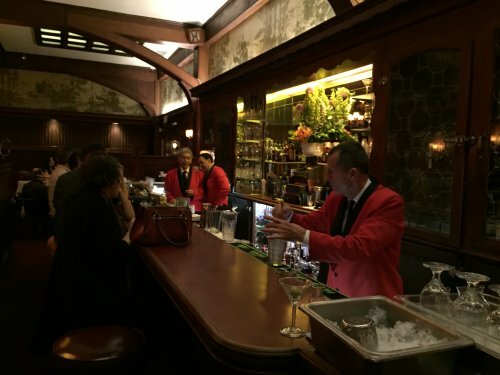 Musso’s was across from the old Writer’s Guild, so it was a natural port of call for their libations. From the New Room our tour went on to the Old Room, which is about half the size of the former. It’s quieter, too. Conversations seemed more subdued, and the tables have divisions that allow for a little more privacy than the open, spacious larger dining room. After scouting round the dining rooms, it was on to a tour round the back of the restaurant, including the rear entrance with its expansive green awning and massive billboard boasting about the venue’s long life. I’d walked in through the more anonymous-looking front entrance, and it’s a shame because walking in through the back is much more interesting. As diners descend a couple of steps inside, they pass by the kitchen first and can get a glimpse at the busy scene inside. With Mark as my guide, I got to see it first hand. We wandered around the huge kitchen, bustling with servers and chefs hard at work. I saw fixtures that have been around for decades even though they’re not always in use, like a massive pizza oven. And as we walked through the place, I kept noticing Mark break off for quick asides with his staff. He showed an interest in how their night was going that went far beyond a perfunctory check-in with employees. But the tour didn’t help me decide on an entree. Once we were back at the table, I told Mark that part of the problem was the sheer size of the menu. 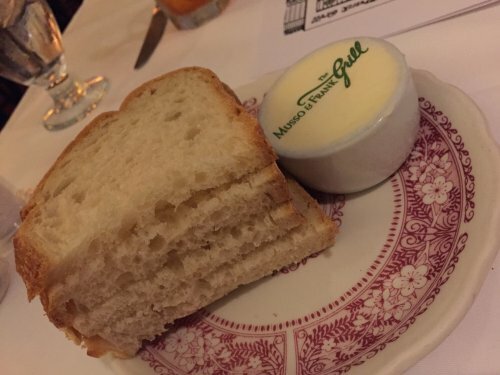 There are about 125 items on the menu — and that’s considered pared back from the 140 dishes Musso’s originally offered. Hollywood’s early years were a melting pot of American and European cultures with a large immigrant population. Musso’s menu targeted that by offering a wide range of food from steaks to chicken pot pie (one of its specialties) to pastas and even Hungarian food. “The people that came from Europe knew they could come to Musso’s and have a little taste of their home country,” Mark said. But having such a large menu means major costs keeping all that food on hand. 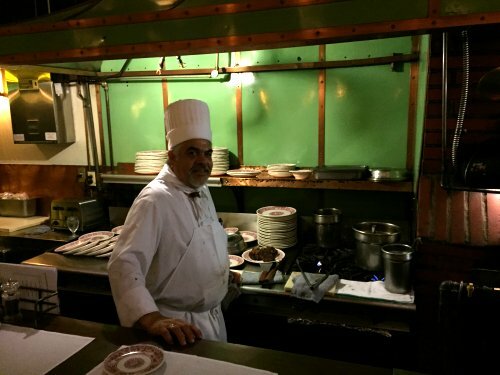 Musso’s is on only its third executive chef in its 95 years. The first executive chef Jean Rue led the menu from 1922 to 1976, and after his passing his protege Michel Bourger took over until 2007. Bourger died in 2007, and then the restaurant was without a permanent executive chef until Mark came in to the business and hired J.P. Amateau. “He’s a classically French-trained chef, I knew he was the right person to take on the legacy of the restaurant,” Mark said with a smile. Mark and J.P. worked together to refine the menu, trying to address restaurant critics’ attacks that the food had started to become bland and forgettable. “A lot of the reviews of Musso’s about five or six years ago said the ambience was great, but the food was just blah. So J.P. tweaked the recipes to give them some flavor,” he said. For example, back in the early 2000s a grilled salmon would have been thrown on heat and dumped on a plate with little extra thought. Now the chef sprinkles some brown sugar on it to give it a slightly caramelized crust. Mark didn’t want to abandon the old favorite dishes, but he said J.P.’s tweaks to the dishes have helped to reinvigorate them. “One negative thing for chefs here is that there isn’t much room for a lot of creativity with the menu,” Mark conceded. So he addresses that with the daily specials menu, in which J.P. gets to experiment with different types of dishes and exercise his skills that way. Still trying to decide on my main course, I asked Mark for his suggestions. He again mentioned his outdoors upbringing and said he’s a huge steak fan, and would have that. He suggested I consider the lengthy fish section of the menu, in particular the sandabs. I’d never heard of them, but as he explained it they’re a thick, flaky white fish breaded and then sauteed in a lemon-caper sauce. It’s a dish they’ve had on offer since 1922. 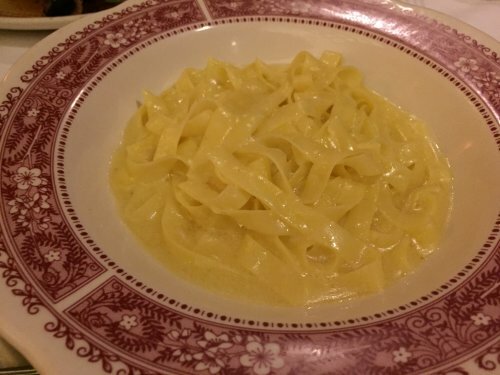 I was almost sold on that when Mark brought up the pasta — in particular their fettucini Alfredo. J.P. has revamped most of the Italian dishes except for this one. That’s because the recipe comes from Italy. Black-and-white screen stars Mary Pickford and Douglas Fairbanks fell in love with the original version of the dish when they had it at the restaurant of its creator Alfredo Di Lelio I in Italy. They begged and begged Alfredo for the recipe, and finally persuaded him to part with it when they gave him a gift of a golden fork and spoon. 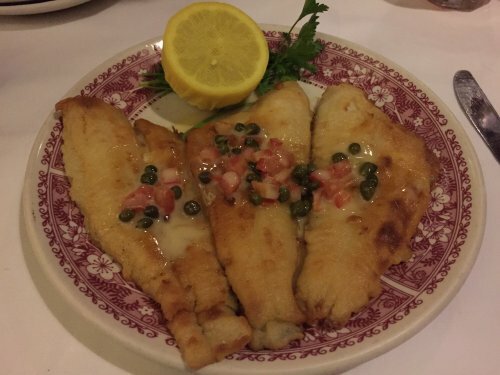 They brought the recipe to Musso’s and had the chef make it. But it was never officially on the menu — until Mark found it one day in the archives. “It’s a very simple dish, not heavy with cream like the American style,” he added. I had to try it. But I also wanted the sandabs. A glutton’s dilemma. Mark suggested getting a small order of the pasta to try, and having the fish as my entree. Sold. And I’m glad he pitched that idea, because this fettucini Alfredo was outstanding. The thin pasta was indeed coated in only a light layer of sauce, made with parmesan cheese, a special butter that the restaurant imports from Italy, and a secret ingredient or two. “The creaminess of the dish comes from the butter that we outsource,” Mark said. His choice of the bone-in rib eye steak was impressive. “You can get steak two ways here, bone in or out,” he explained. “The rib eye is prime rib but instead of roasting it in the oven, it’s grilled. What the bone does is, as it’s cooking, it brings moisture and flavor back into the steak. With the bone out, the juices tend to run out and a little bit dryer,” he added. I didn’t try the steak, as the plate of sandabs was massive enough. Three decent-sized pieces of fish, topped off in a slightly tart sauce and diced vegetables. Mark said his favorite dish is probably the grenadine of beef: three filet medallions seared and laid on a light brown gravy sauce, with Bernaise sauce on top. He also touted the liver and onions that the Rolling Stones come in specifically to eat. “One of the fun things about managing a menu this size is that each dish has a story,” Mark said. 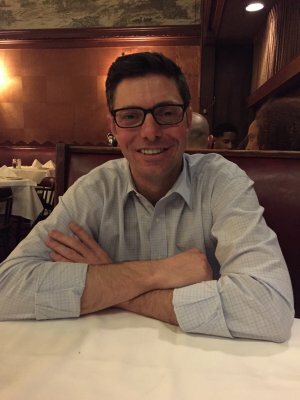 In addition to his full-time role running Musso’s, Mark also sits on the board of directors for the Hollywood Entertainment District (HED), which controls assessments levied on property taxes and decides how to reinvest those in the neighborhood. “It’s really improved Hollywood,” he said of the organization, with funds boosting security, removing graffiti and cleaning the streets. The organization also works to encourage new investment in Hollywood, and Mark said there are promising hotel and residential developments plowing fortunes into the area. When crime was rife in the neighborhood, it was impossible to bring in businesses. So the HED formed in 1998 and started hiring security; providing street cleaning; and taking other steps to make the district more attractive. Mark joined soon after starting work at Musso’s, and has worked for it ever since. “It made it more inviting for companies to come in,” he said of the improvements the HED has made. He said that one major industry that’s making a home in the area is tech startups. “We’ve still got a long way to go, but things are improving substantially,” he added. There’s a long to-do list he wants to get through, including working on having each street have a similar feel, for example making the aesthetics of the main Hollywood Boulevard — which features the paved stars with celebrities’ names on them — look the same. Right now there’s a disconnect in the paving styles, plant life and other features of each block and Mark said that means the area lacks a coherent visual identity. “Tourists come here from around the world to look at the Walk of Fame, but if every block has a different feel, that takes away from Hollywood having an identity,” he said. Mark also works with the city council on issues that are important to him and businesses in the area. 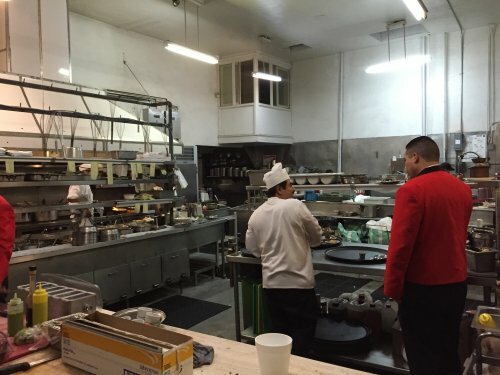 He recently worked with lawmakers to help approve a rise in the minimum wage, and is able to spend time on that thanks to the management team that he has put in place at Musso’s during his half-decade tenure. “I no longer have to come in every day just for it to operate,” he said. Not that he’s slacking on his commitment to Musso’s. “I still process every single invoice, I still write every single check. It’s a way for me to still be connected to the pennies, I know everything that’s going on,” Mark explained. He’s a great conversationalist, engaging company and quick to joke and laugh. And he’s at his most animated when talking about Musso’s, the staff, and the restaurant’s legacy. Clearly it’s a place that he loves. I don’t think I saw him frown once while talking about the restaurant. So I asked if it’s all smooth sailing from here. Although Mark is big on promoting Hollywood, his main focus is on Musso’s and preserving its history, while looking to the future. 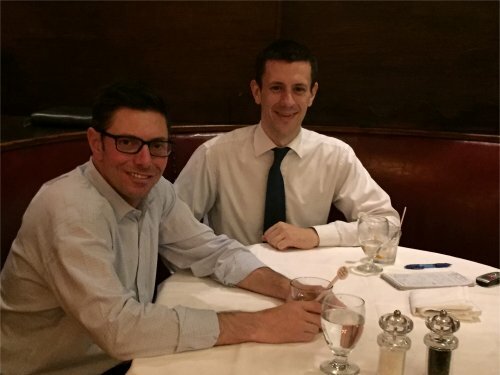 He’s already scribbling out plans for the restaurant’s 100th anniversary in 2019, including a possible night where regulars are invited in to dine at 1919 prices. “I want to give them a sense of ownership of the place that they’ve helped to build,” he said. Then there are cosmetic updates he’d like to make. As our waiter took away our plates, Mark looked around the room, telling me that the carpets — which date back to 1971 — are being torn out in July and replaced with hardwood flooring. It’s a major project, with antique wood being transported over from France and re-milled, because new wood would clash with the old furniture. Mark’s family is also discussing the potential of a further expansion next door, either a private dining room or a stand-alone but related business. He’s toyed with the idea of offering a more informal lunch venue that could revive the name Frank’s Cafe. Other ideas include a potential gourmet market, where customers could buy the same high quality produce Musso’s uses. Working at the restaurant has helped Mark develop a greater expertize in food and love of cooking, he told me. “I’ve always loved going out, eating a nice meal and the flavors that come out of it but never really knew what was involved in making that dish. So I have much more of an appreciation now of food than I did five years ago. I have much more knowledge of what it takes to make those meals by learning from the chefs in the kitchen,” he said. 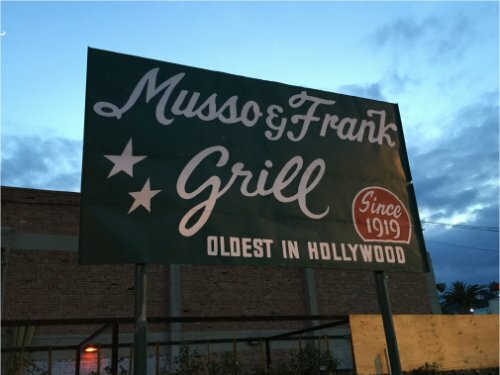 Mark is also thinking about the potential of opening another restaurant in another city, not necessarily part of the Musso & Frank Grill brand. It’s a far cry from the early days when he knew nothing about the industry. So what does it to take to be a good restaurateur? “You’ve got to know your math, you’ve got to know your targets and where you should be operating as far as cost of goods, you need to know what percentages you should be hitting. You have to be able to spend the time to dive into any problem there is and learn it and fix it,” Mark said. That’s the approach he uses in his work to keep improving the Musso & Frank Grill. “My motivation is to not make some multi-million dollar yearly profit. I’m not trying to do that. My goal is to maintain the legacy and iconic appeal of this place,” he said. 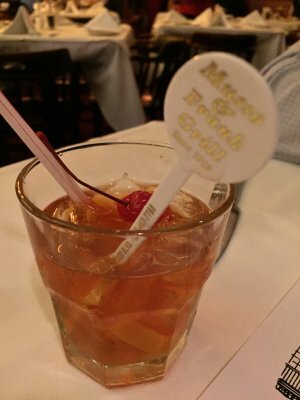 Then came another round of cocktails, and one last toast: to the future of Musso’s. This was really interesting. I also just read the article about you in the Washington Post. Very intriguing. Take care. Nice read! Thanks….ditto, just read about you in the WP. Keep it up!